This is a book about history – not the kind of dull chronology of dynasties and battles to which we were exposed in our school days but meaningful history that is deeply relevant to our lives today. It is about the human spirit struggling for self-expression and self-understanding, which is a struggle that continues to this day, perhaps more so than ever. We live in an age of unprecedent challenges and opportunities. On the one hand, we face the grim reality of overpopulation, hunger, ecological disasters, and new devastating diseases, as well as the ever-present possibility of a nuclear holocaust. On the other hand, science constantly expands our intellectual horizon and helps create new technological wonders that, we hope, will solve some of our problems. Biologists are ‘engineering’ genes to increase the productivity of vegetables and fruit trees; chemists are unlocking enzymes to make them usable for nonbiological purposes, such as waste disposal, or to repair DNA in order to enhance and prolong life; and physicists are working on superconductivity and the use of lasers in computers. Scientists are also exploring the possibility of bionic organs, the application of electromagnetic fields in the healing process, and artificial intelligence. The list could easily be extended to fill the remaining pages of this book. Every day science adds a profusion of knowledge to our data banks. Yet only a fraction of this knowledge finds its way into our brains, and only a small proportion of that fraction is truly assimilated by us. Indeed, the knowledge explosion is one of the problems we are facing. Like any explosion, it leaves us with fragments. Even specialists are no longer able to keep abreast of the developments in their own discipline. They know less and less about more and more. With around 7,000 scientific papers written everyday in the English language alone, how could any one person be expected to follow, never mind catch up with, the ever-receding horizon of scientific exploration? The lay public is even less able to keep up with, or make sense of scientific knowledge. There is a significant time lag of approximately twenty-five years between a scientific discovery and its assimilation by the public at large. In other words, what scientists are investigation today will not be common knowledge until our children are young adults and perhaps have children of their own. Our shool books are outdated, and even university textbooks tend to reflect only ‘well-established’ knowledge. Facts and hypotheses that do not readily fit into the current way of thinking – the reigning paradigm – are generally ignored, if not suppressed. When it comes to pet theories and cherished opinions, scientists are as human as anyone else. This is true whether we are considering physics, chemistry, astronomy, archaeology, or historiography (the description of history). The alarming truth is that we have no firm grasp on what all the information produced by science means. We are unable to understand the interconnection between the amassed facts and figures. Our so-called Information Age is rich in data but sadly lacking in understanding. Generalists – scientists or scholars who attempt to see the larger picture – are few and far between, because they are generally not encouraged by the academic establishment. Hence we are left with bits and pieces that seldom fit together, giving rise to anxiety rather than understanding. As many clear-sighted observers of the human drama have noted, our era is short in vision and wisdom. It is therefore not surprising that many of us are wondering about bygone ages and past civilizations. How did they meet life’s challenges? How did they view nature? What trials and tribulations shaped their experience of the world? How did they meet the great natural catastrophes – earthquakes and volcanic eruptions – that we know afflicted humankind throughout its civilized history? How did they use their knowledge? Did they have true wisdom? For what reasons did civilizations like Sumer, Babylonia, Assyria, Dilmun, Elam and, not least, pharaonic Egypt become extinct? What errors of judgement did our distant ancestors commit? How did they fail to adapt successfully to the changing conditions in the world? To be sure, many ancient cultures looked nostalgically back at a Golden Age when peace and harmony reigned in the world, while their own times were frequently marked by political turbulence and cultural upheaval. Was there such a Golden Age? Has any of its wisdom survived? How was the torch of human understanding been passed from one age to the next? What has been lost in the process of spanning millennia? Can we learn any lessons from the thin strands of tradition that withstood the attrition of time? Questions like these, which concern the value of what may have been lost, are not asked by mainstream historians because, like their colleagues in physics of chemistry, they chase the mirage of value-free science. In real life, however, facts and values are inextricably interlinked. By ignoring this circumstance, scientists merely squeeze the lifeblood out of reality, making it into an abstraction that cannot give us meaningful guidance. In this book we are trying to answer some of these questions in regard to a civilization that has a very special place in the story of human cultural evolution and that nonetheless is barely known. Ever since Napoleon’s days, we in the West have been dazzled by the spendor of pharaonic Egypt – with its impressive pyramids, the mysterious Sphinx, and the magnificent treasures of Tutankhamen. We also have been impressed with the intellectual achievements of the learned elite of Sumer, which, according to our schoolboks, was responsible for the invention of writing, the potter’s wheel, wheeled carts, cylinder seals, cosmology, formal law, and bicameral political congress. Most of the ‘first time ever’ claims made for the Summerians have in recent years been exposed as exaggerated or absurd. There is mounting evidence that neither Sumer nor Egypt quite deserve the pride of place among the ancient civilizations. Rather the cradle of civilization appear to lie beyond the fertile valleys of the Nile, Tigris and Euphrates Rivers. We invite the reader to join us in a journey of discovery, which in its implications, seems far more thrilling to us than the discoveries of Troy, the Elamite civilization in Iran, the ‘lost’ civilization of Dilmun on the island of Bahrain in the Arabian/Persian Gulf or, most recently, the discovery of what may have been the kingdom of Sheba in the extreme south of the Arabian peninsula. As we will show, India is the giant that looms behind these early urban cultures. This astonishing finding completely revolutionizes our understanding of ancient history. It challenges us anew to look for the cradle of human civilization. We do not claim to have solved the riddle of the Big Bang of our civilized universe, merely that we are possibly closer to it than ever before. In this book we introduce exciting new evidence that sheds light on a hitherto obscure phase of ancient history. This is the first time that these amazing developments in archaeology and history are reviewed in a comprehensive and comprehensible fashion. Why has it taken so long to recognize the significance of ancient India in the saga of human civilization? 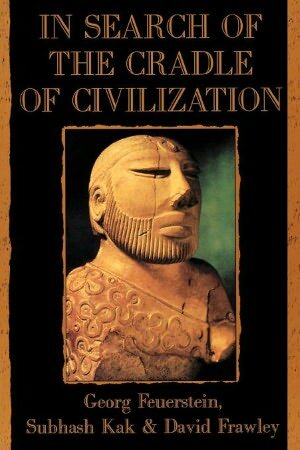 In his book Looking for Dilmun, Geoffrey Bibby rightly remarked that the ‘Indus Valley civilization is the Cinderella of the ancient world.’ Indeed, for a variety of reasons, ancient India has been sorely neglected by archaeologists and historians. Prevailing misconceptions and biases have long hampered the study of ancient India’s civilization. Fortunately this regrettable situation is beginning to change, and the new attitude in scholarly circles has already proven enormously productive. Quite likely, the recent successes in reinterpreting ancient India’s civilization will further speed up this promising process of revisioning ancient history that a handful of daring historians and archaeologists have begun. As we have indicated, we believe that all this is not merely of theoretical interest. Our understanding of history can prove crucial to how we interpret life in the present. Of course, cynics hold that we can learn only one lesson from history; that humanity so far has learned nothing from it. Sadly enough, there is some substance to this claim. But this pessimistic view does not penetrate deep enough. For we must not overlook the fact that it is precisely our awareness of the past, especially our errors, that has guaranteed humanity’s continued existence to date. Our species would have become extinct long ago if we had not learned anything at all from our mistakes. We know that entire civilizations have perished, but there always have been survivors to tell the story and to resume the human experiment. But this time around we are facing the unbelievable danger of there not being a single survivor on this planet. Unlike past civilizations, which were relatively local societies, our own civilizations has spread itself across the entire planet. The ecological imbalance triggered by our unwise way of life affects not only one region or continent, but every living organism on Earth. A nuclear holocaust or global ecological catastrophe could bring modern civilization perilously close to extinction. This makes it all the more pressing to understand our species’ past and benefit from the experience and hard-won knowledge of our ancestors. While the present-day challenge is unique in its magnitude, it involves fundamental matters of living – particularly in the moral and spiritual realm – that may well have been better understood by earlier civilizations and cultures. Clearly we moderns are in a quandary. We have effectively departed from the old ways but have not yet created viable new forms of meaning. Many of us feel utterly lost and confused. Western civilization, whose tentacles reach around the globe, is transitional. The transition is radical and decisive. Another word for our situation is crisis. We are in the throes of a deep crisis that, when we go to the root of our problems, is a crisis of consciousness. We are facing the considerable challenge of having to evolve into planetary citizens – a challenge that calls for conscious choice and commitment. We would do well to ponder the wisdom of the ancients, who had to pass through their own crises and formulate their own answers to the problems of existence. We must not expect that all their answers or solutions will apply to our present-day situation. However, we can expect that some of our ancestors’ more important answers – their wisdom distilled in the crucible of life – will have a bearing on our own dilemma. Ancient India, we feel, has much to teach us.